Italian food is one of the best things on Earth, if you ask me. What could be better than a plateful of pasta with a rich, flavoursome sauce, accompanied by a bold glass of red and good company? Such simple pleasures can be found at many an Italian restaurant in Newcastle city centre and beyond, but how many of those could hand-on-heart say they’re delivering the goods with lovingly hand-rolled, FRESH pasta? Not so many, I’m sure. Zucchini Pasta Bar, a new city centre restaurant, is boasting exactly that. Fresh, authentic pasta, hand-rolled daily and paired with sauces that slightly break the norm. 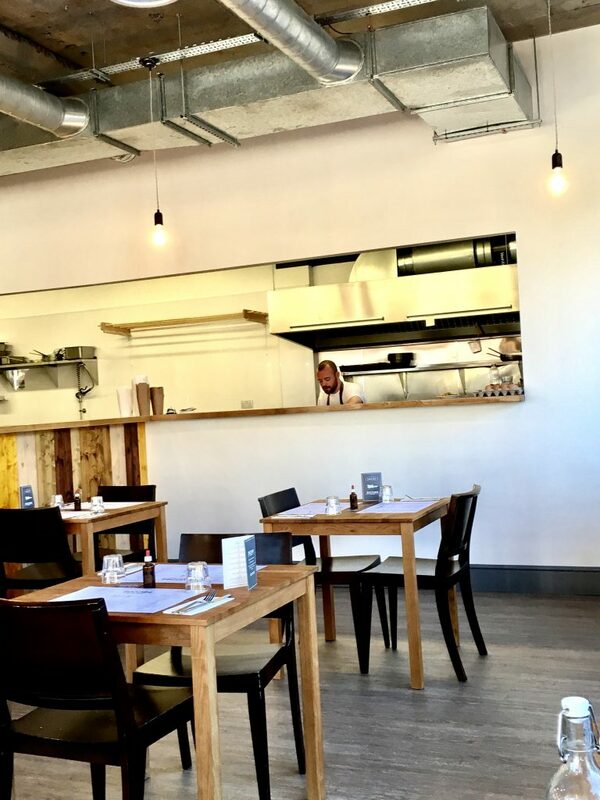 It’s the brainchild of Alan Barker, who previously headed up the kitchen at very pleasant Sunniside restaurant, Sorella Sorella. I was a big fan of his food there, and I’m even more enamoured with the pasta dishes at Zucchini Pasta Bar, his very own restaurant with a very distinct look and offering. You may have seen Secret Diner’s very enthusiastic review of Zucchini Pasta Bar. Give the old web a search and you’ll find a selection of excitable reviews, which is quite the feat considering they’ve only been open around a month. 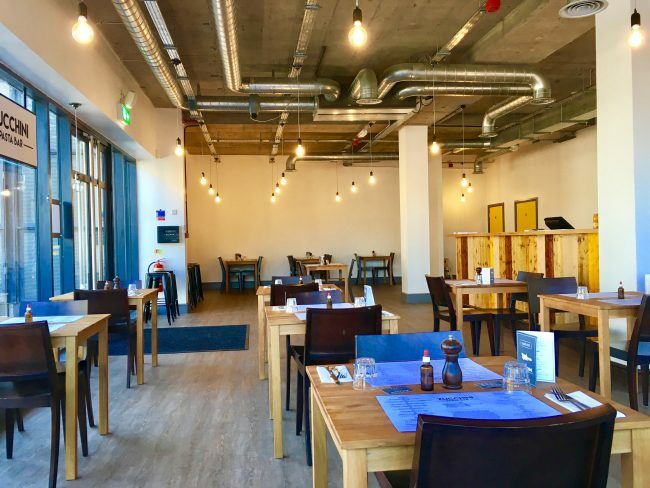 Barker’s intention is that the restaurant will become a go-to city centre restaurant for a good quality, reasonably priced lunch for city centre workers and shoppers alike. It’s location, at 55 Degrees North in what was City Retreat, is super convenient, and the light and airy space is chic and rather trendy – certainly somewhere I’d be happy to spend my lunch break. The menu has a selection of classics like Amatriciana and Pomodoro, and a number of twists on traditional dishes like lasagne, with the Zucchini Pasta Bar version offering lamb and mint bolognese with open sheets of golden pasta. 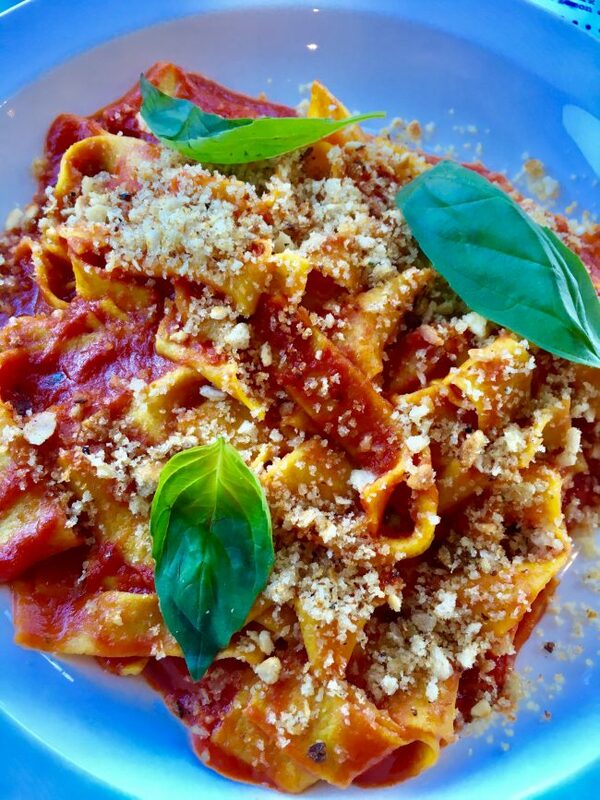 The restaurant adopts traditional pasta making practices, with Barker recently telling The Chronicle that this enables them to provide “a cheaper and higher quality plate of pasta for the customer.” And reasonably-priced, it is. 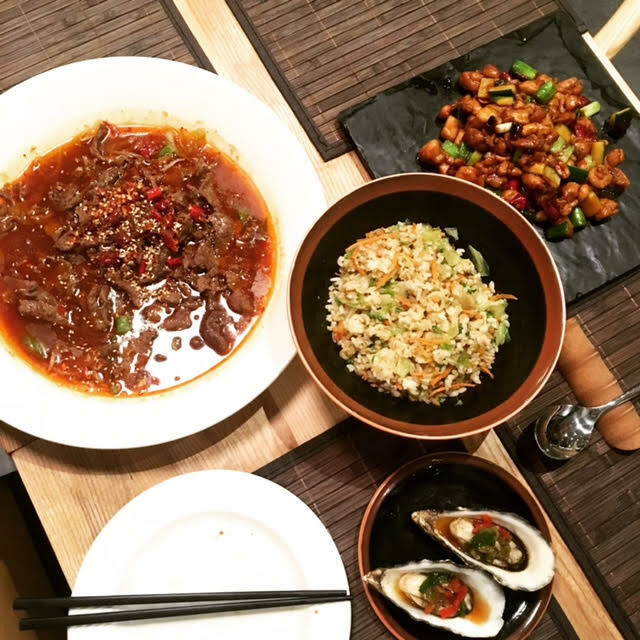 The whole menu would allow for a delicious lunch (main + side) coming in at under £10. Some dishes are so reasonable you could even add a dessert and still come in at under a tenner! We had a couple of the sides to share, including Lemon Zest Olives, Finocchiona, a fennel-based Tuscan salami, and the Lemon & Rocket Salad. 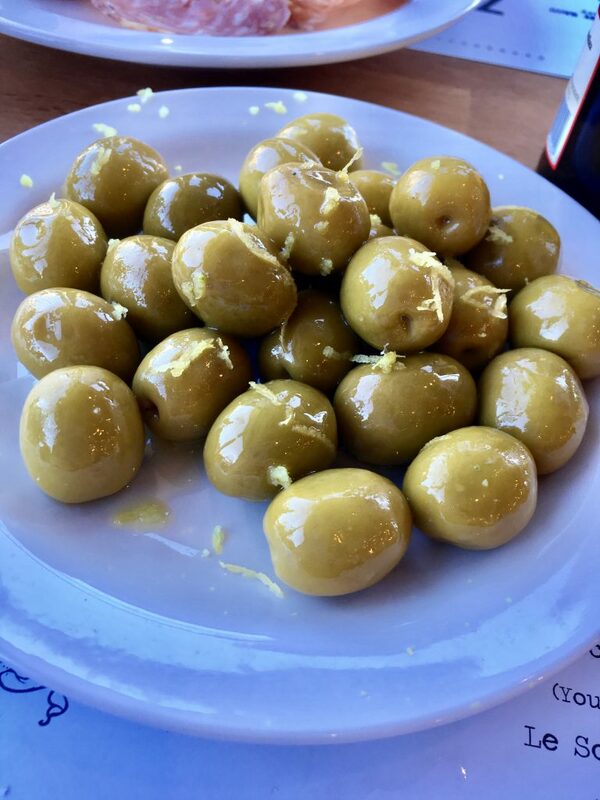 The olives came out glistening with olive oil and crowned with lemon zest and there were more than enough for both of us to share. 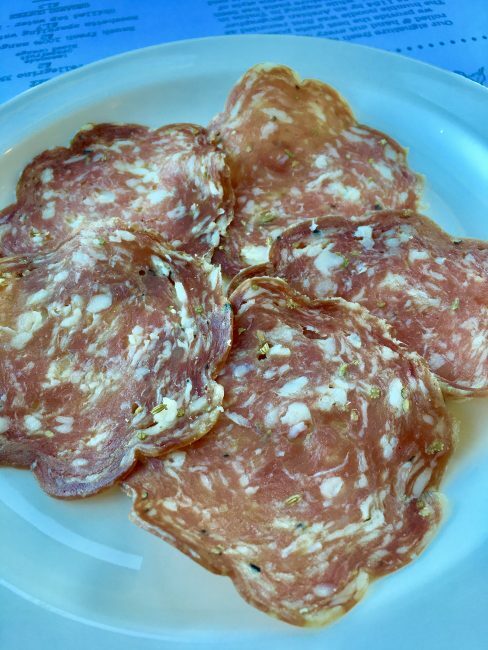 The Finocchiona was punchy and mature, with a gutsy hint of fennel. Again, plenty of it, and great on the side of the Pomodoro. All side dishes are only £2 each, and there’s a nduja and gorgonzola number I’ll be trying next time. Oh, and the pork meatballs. Ridiculous value really, when you think of it. And the pasta! My goodness. 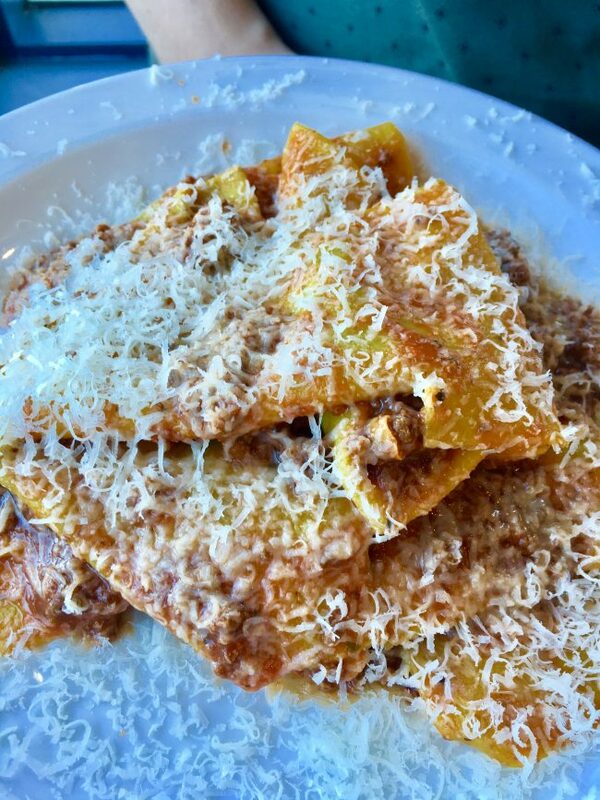 We had the Lamb & Mint Open Lasagne, a plate packed with silky pasta squares and a lamb bolognese, covered in fresh parmesan. I’ve had lamb lasagne before, but never with mint, and for me, it really worked. I’d eat mint sauce with basically anything (ssh, don’t tell anyone what a philistine I am!) so it was a welcome twist for my palate. This dish comes in at a very reasonable £5.50 and while I’ve seen some minor whinges that the portions are on the smaller side, I actually felt like they were the perfect size for us. It meant we could have a bit of all of them, kind of like a pasta conveyor belt, and not feel obscenely stuffed afterward. We also shared a portion of the classic Tagliatelle Pomodoro (£4.50), a mountain of gorgeous tagliatelle in a fresh, perky tomato sauce packed with garlic and fresh basil. As mentioned, I had some of the finocchiona on the side of this and it was a great companion, so if you want a bit of meat with your classic Pomodoro, I’d recommend this. Come to think of it, it would also be great with the pork meatballs, I imagine. After enjoying half of this and half of the open lasagne, I was feeling slightly full, but there was absolutely no way I was going to Zucchini Pasta Bar and not trying their already-famous Beef Shin Ragu with Parpadelle. Sorry stomach, but it was happening. This dish is by far the star of the show. I’ve thought about it repeatedly since having it, and the next time I’m in town for lunch I’ll be getting a plate all to myself. The beef shin is gorgeously tender and packs a punch with garlic, red wine and rosemary behind it. It’s a little on the rich side, but it’s so delicious you won’t mind – it’s the kind of pasta dish that’s like a hug on a plate. The parpadelle is cooked perfectly, too, a little al dente which is just to my liking. 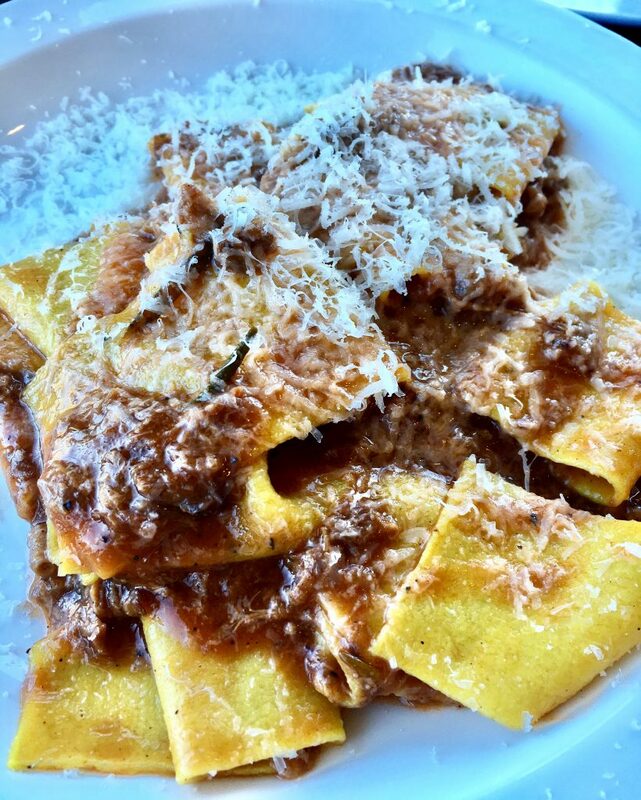 The Beef Shin Ragu & Parpadelle is one of the more “expensive” dishes at £6, but seriously, for the quality and flavour you’re getting, I’d still say it’s quite the bargain. 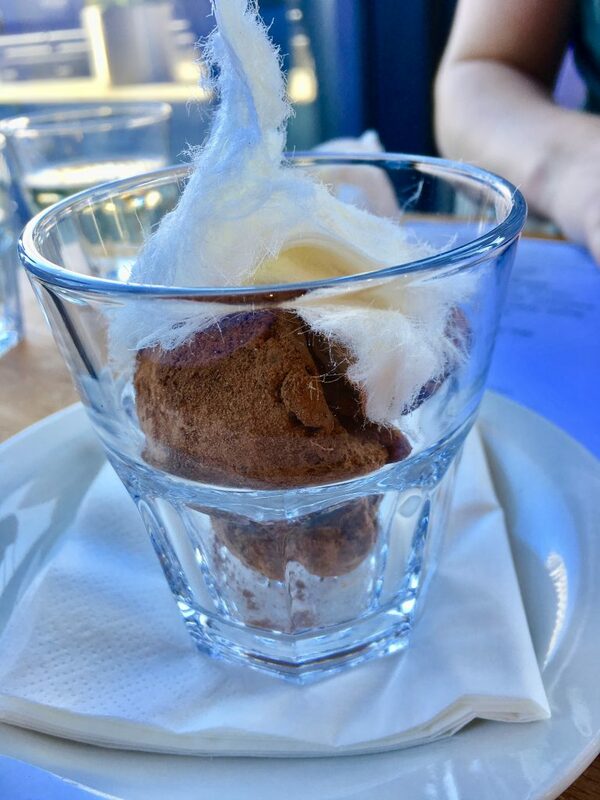 Ordinarily I’d never order a dessert, but with Zucchini Pasta Bar’s coming in at only £3 a pop, we gave their tiramisu and gluten-free Mint and Dark Chocolate truffles a try. The tiramisu was outrageously boozy with a light, almost fluffy sponge. 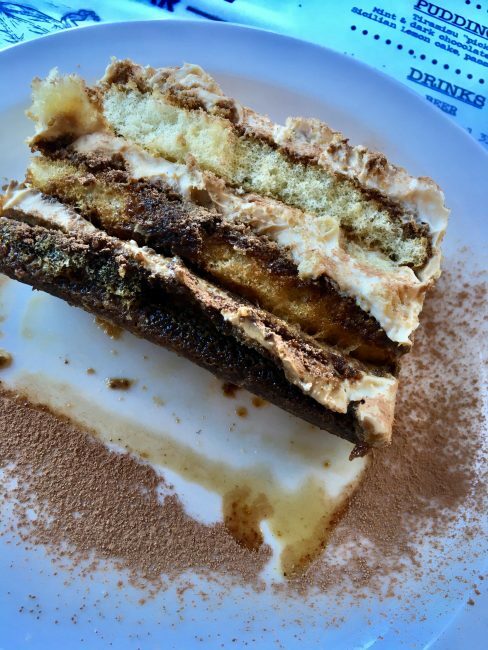 Plenty of chocolate and cream, too, so if you’re looking for a super-authentic tiramisu like you’d find in a family-run restaurant in Venice, grab a slice of this. The truffles were extremely rich, perhaps too rich for my savoury favouring palate, but we gave them a good try. If you’re into desserts, think of these as extremely good After Eights – the mint is really strong and the chocolate rich. Perfect with a good coffee, I expect. They arrived topped with candy floss, which is making quite the comeback in restaurants these days, but on the whole it was all just too sweet for me. With our meal we enjoyed a miniature bottle of prosecco each, courtesy of Zucchini Pasta Bar, but had we not had this I would have been doing for their Puglian house wines, at only £2.80 a glass. TWO POUNDS EIGHTY A GLASS, or £13.50 a bottle, which is incredible value. There’s also a classic Bellini on the menu and that’s it on the cocktail front, and I have to say I was really enjoying the fact the restaurant has such a small but perfectly formed drinks list. If you’re a beer/lager drinker, it’s Peroni Red Label at £3 a bottle and that’s it. Really though, it’s all you need when it comes to Italian lager. The service was friendly and efficient and there are plenty of places to sit, and if I still worked in the city centre I’d be taking my laptop along with me to enjoy a long, working lunch. Sadly, no longer an option for me, but it could be for you! I loved the open-plan kitchen, the stark decor and cool lighting and really, just the general atmosphere. I spoke to Alan after our meal and was told that there may be later opening hours on the cards as they’ve applied for a later license, and if that’s the case then I’ll without doubt be back for a tasty, reasonably priced dinner with friends. So if you’re a pasta fan like me and want to support a new, independent restaurant that offers great quality, fresh Italian food, then give Zucchini Pasta Bar a go. They’re open Monday to Saturday from 12-3pm for lunch, then close for an hour to prepare more fresh pasta for evening service, which is 4-8pm. As I say, this will hopefully be even later going forward, so keep your eyes peeled on their website for more info as it’s announced! Their dishes are also available to take-out, with speedy service that’ll ensure you have piping hot pasta to take back to your desk. Personally, I’ve never been to Italy and I certainly don’t have an Italian ‘Nonna’ to ply me with fresh, organic pasta every day, but if I had/did, I imagine I’d be comparing it to the fantastic offering at Zucchini Pasta Bar. 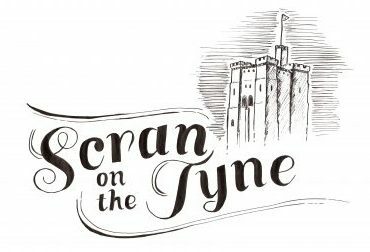 Newcastle may have some great Italian restaurants, but this one focuses on pasta as the real star of the show, and I’ve gotta say, they’re succeeding triumphantly! 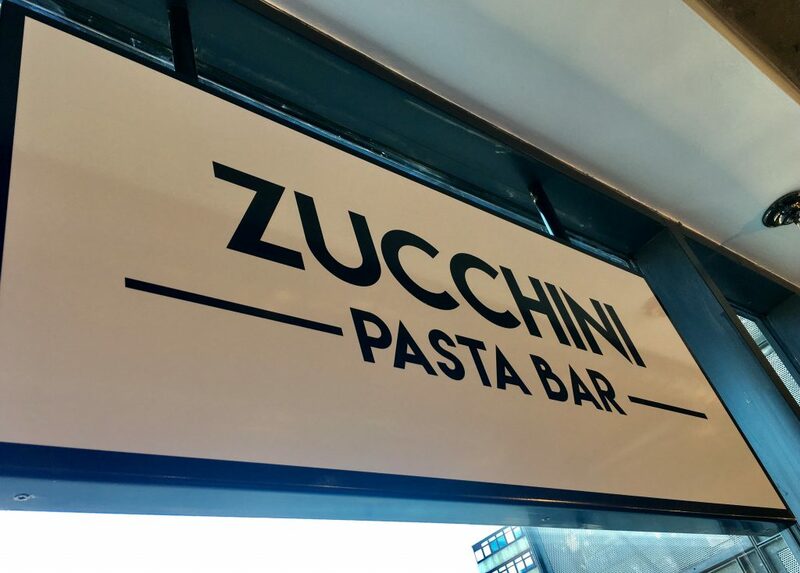 You can find Zucchini Pasta Bar at 55 Degrees North, Swan House Roundabout, Newcastle upon Tyne, NE1 6BL – “just a meatball’s throw from the Tyne Bridge”. It’s a walk-in kinda joint, so they won’t take reservations, but I expect if you’re wanting to go as a big group, it’s probably worth emailing info@zucchinipastabar.co to make sure you nab a spot. 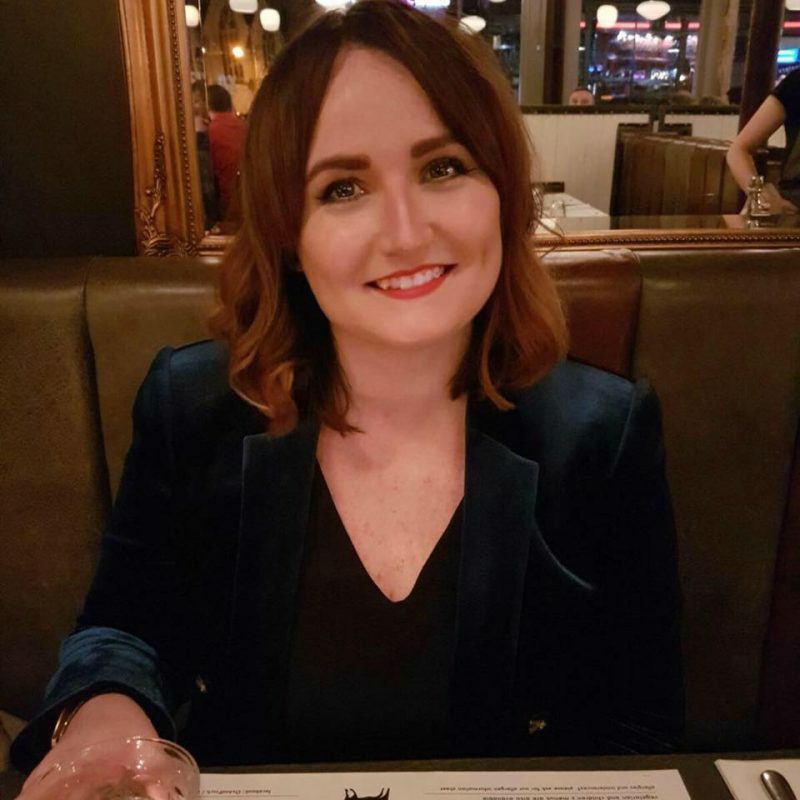 We were invited to try out Zucchini Pasta Bar for the purpose of this review and as such, food and drink was offered on a complimentary basis. As always, my views are true to genuine experience and not influenced in any way by the fact it was free. Big thanks (and good luck!) to Alan and the team for looking after us – we shall be back very soon!